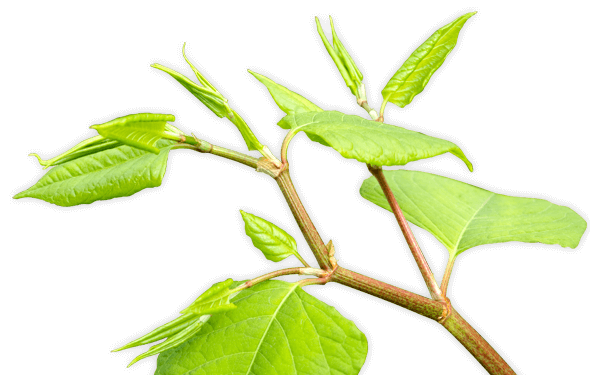 We are a leading specialist in the identification, treatment and removal of Japanese knotweed (Fallopia japonica). This invasive, fast-spreading plant can be very difficult to get rid of without the help of a qualified expert – fortunately, the Taylor Weed Control team are here to assist you! Our professional Japanese knotweed removal specialists have more 15 years’ experience. This service is available nationwide – we have eradicated Japanese knotweed from properties in Cardiff, Swansea, Newport, Bristol, Gloucester and beyond. Contact us now to request a free survey! Unlike some other companies who offer this service, Taylor Weed Control provide honest and transparent advice to help you eradicate this extremely invasive weed from your property. As the largest licensed Japanese knotweed removal specialists in South Wales and South West England, we offer a comprehensive range of services including surveys, removal, and reports for mortgage applications. We have perfected our treatment programmes to keep costs to a minimum, and our staff will be happy to answer any questions you might have. Many contractors who claim to specialise in the removal of Japanese knotweed fail to follow the relevant code of practice laid out by the Environment Agency and end up making the spread of this highly invasive plant even worse. Taylor Weed Control are registered with the Property Care Association, and our reports are accepted and approved by the Royal Institute for Chartered Surveyors (RICS), so you can rest assured that our services meet the very highest standards. All of the reports and surveys we provide are accredited guarantees. Our Japanese knotweed removal services are extremely affordable when compared to the majority of companies in the UK. Starting from just £750 (plus VAT), our removal cost includes all the accreditation reports required by lenders. Identifying Japanese knotweed can be a difficult task. The plant’s growing cycle means that its appearance can vary significantly depending on the season. During its dormant winter stage, for instance, the weed is almost impossible to identify. However, our specialist service makes Japanese knotweed identification extremely simple – contact us today to arrange a free survey. Japanese knotweed (Fallopia japonica) is an invasive plant that has become a major problem throughout the UK. Due to favourable conditions, it thrives in areas like South Wales and South West England, and it can be found in an ever-increasing variety of sites nationwide. Under the Wildlife and Countryside Act 1981, it is an offence to plant or encourage the growth of Japanese knotweed or to allow it to spread. It’s not clear how or why this species was introduced to Britain, although theories and myths abound. Some claim that it was used as a decorative plant during the Victorian era; others say that it was brought here for animal fodder. We’ve even heard it said that it provided support for levees, canals and railway embankments, with the root system used to anchor the soil. One of Japanese knotweed’s defining characteristics is how quickly it spreads. During the summer, when the plant is at its most aggressive, it can grow by as much as 2cm per day! It also has a tendency to form a thick, leafy canopy that prevents other plants from developing. Though not toxic to humans and animals, the plant does not provide a viable habitat for native birds, insects or mammals. It is strong enough to grow through cracks in walls, tarmac, and concrete slabs – it has even been found in cavity walls and drains. Japanese knotweed has been known to cause major damage to roads and the fabric of buildings, and as a result, it may be difficult to obtain planning permission or finance for knotweed-contaminated properties. Like most other perennial weeds, Japanese knotweed has a highly invasive rhizome root system. Burrowing as far as 2 metres down into the ground and reaching up to 4 metres, this extensive root system is the main reason why Japanese knotweed can be so difficult to remove. If not managed properly, cutting the plant or disturbing the soil around it may actually end up encouraging the weed to grow. A tiny fragment of the root can quickly establish a new plant stem, and so Japanese knotweed can spread from these rhizomes being transported to other sites. To make things even more difficult, a 3cm piece of rhizome can remain dormant in the soil for several years before it actually appears. This is why it is so important to take a professional, scientific approach when attempting to remove Fallopia japonica from your property. All too often, well-intentioned but misinformed attempts to eradicate the invasive weed end up helping it to spread further. This is a site clearance technique that can become very expensive very quickly. Not only does it require the use of heavy excavation machinery, landfill charges are added for transportation to specialist landfill sites. Eradicating Japanese knotweed with herbicide is a far more affordable method that typically costs just 10-15% of the prices quoted for mechanical removal. Specialist herbicides are required, and these should only be applied by qualified operatives. If using herbicides to get rid of knotweed, it is critically important to ensure that nearby watercourses are not contaminated with herbicide. Spraying the leaves is the most efficient method of herbicide application, although several repeated applications may be required over a number of years (since the rhizome root system can remain viable for quite some time). Spraying should be carried out between May and September, with at least 2 and ideally 3 applications completed during that time. If time is a major factor (e.g. when a developer wants to build on a site where delays will add significant costs to the project), it may be prudent to combine spraying with mechanical removal. The best method is to spray the affected area several weeks prior to mechanical removal so as to get the herbicide into the root system. The area should then be excavated to a depth of 7 metres, with a buffer zone of at least 4 metres around any knotweed to allow for the spread of the root system. All knotweed rhizomes must be removed from the site and carefully transported to an approved site that will accept Japanese knotweed. Throughout the whole process, only licensed transport companies who are able to provide the correct certificates should travel to the landfill site. All equipment used – even footwear and overalls – should be cleaned and sterilised to prevent the spread of knotweed. Even after clearing the site, it is advisable to continue monitoring the area and be prepared to spray for regrowth.